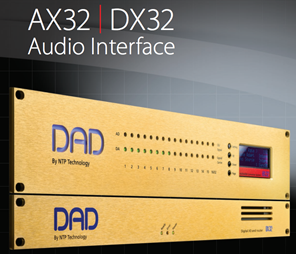 AX32 is your audio routing centerpiece, digital format converter, world-class AD/DA converter and monitor controller. Quite simply, AX32 changes seamlessly between workflows in seconds, optimizing your production time and efficiency. With the AX32you get pristine AD and DA conversion with superb sonic quality, versatile I/O structure and IP Audio via Layer 3 Ethernet (Dante) that follows the track of the AX24 with an enhanced performance in terms the sonic quality of the AD andDA conversion, up-to 48 analogue audio channels and a flexible digital signalinterface, routing and distribution structure. With all I/O card and options installed, you can control a 1,500 x 1,500 matrix of audiochannels. 8 I/O cards and 2 I/O modules can be installed. Just imagine the flexibility and swift change between workflows you would have right at yourfingertips. All operation and functional control is managed via the DADman control software. A total of 8 card slots are available in the chassis frame. You can use 6 slots for analog cards each with 8 channels for a total of up to 48 AD/DA input and outputs. Finally, you can allocate one or more expansion slots for the SPQ Speaker Processing DSP card that offer no additional I/O capability, but a staggering 1,024 individual EQ filters for speaker room correction on up to 128 channels.